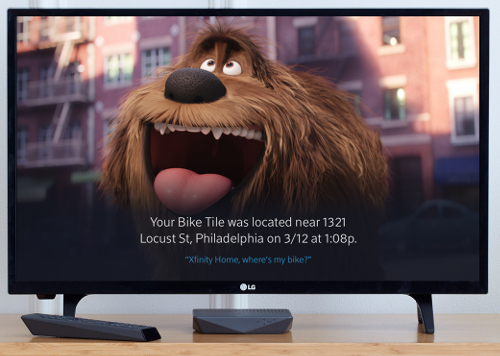 PHILADELPHIA, PA AND SAN MATEO, CA — Comcast today announced a new partnership with Tile that will enable Xfinity customers to use their Xfinity X1 Voice Remote to locate Tile devices anywhere and see the results of their search on the television. This is the first video and voice control partnership of its kind for Tile and is another step in Comcast’s effort to make home automation simple and easy for millions of customers. According to a survey from Esure Home Insurance, the average person spends more than 60 hours a year looking for misplaced items. Tile is the world’s best-selling Bluetooth tracker, helping users locate over three million items every day, including cars, backpacks, suitcases, keys, and wallets. Simple and easy-to-use, Tile Bluetooth trackers can be attached to any item. If the item is misplaced, lost or stolen, X1 customers can say, “Xfinity Home where are my keys?”, “Xfinity Home find my purse”, or “Xfinity Home locate Sam’s backpack” to display the last known location and address of the missing Tile on their TV screen. At launch, only Xfinity Home customers with the X1 voice remote can easily add their Tiles by downloading the Xfinity Home app (iOS or Android) and following the prompts in the mobile app. Later this year, Comcast and Tile plan to expand eligibility to all Xfinity Internet customers as well.